Sarwat Chadda's Blog: Sweden. It's so hot right now. All of a sudden I seem to be reading nothing but Swedish books. Maybe it's the long, bleak (but beautiful) winters. The pine forests. I don't know, but suddenly I'm adicted to their flms and books. First we had John Ajvide Lindqvist showing us what a REAL vampire story should be like- tragic and terrifying- with Let the Right One In. Then Jan Guillou writing his Templar trilogy and giving us old school Templars and a taste of exactly how hard the old knights were. Which was very. I'm half-way through reading The Girl With the Dragon Tattoo. Saw the film last night. 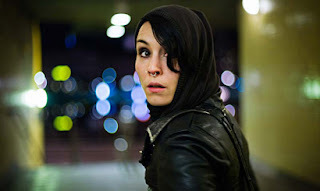 It's a brutal thriller and got me wondering about Lisbeth, the femal protagonist. She's a deeply emotional disturbed young woman and bad things happen to her. She suffers but doesn't allow herself to be a victim. In fact, she becomes Nemesis, the goddess of vengeance. And she gets her revenge. The story's an elaborate thriller and a horrific one. The monsters are truly monstrous and the evil is very real. It's the first film in a while that's got really under my skin and if you get the chance, see it. *I know, next to Finland. Ha ha. That's because I have impeccable taste. Yes, it's much more next to Norway than Finland. But still next to Finland, even if it's only a little bit. I should have also mentioned other great literary icons that hail from Sweden, Pippi Longstocking and the Moomins! Does anyone remember the Moomin telly series back in the 1980's-early 90's? It seriously freaked me out. That was a quick blog Sarwat. Are you always straight on it? Yes very good film, good trilogy, but not many coffee machines in this film...strange. I was eating 'Kales Kaviar' on hardbread before I was weened. I noticed Mikael did make some meatballs. You'll be into Wallender next. I know what you mean about the coffee machines. Also strange is the lack of Abba in the film's soundtrack.